3 days of Action in Brighton! 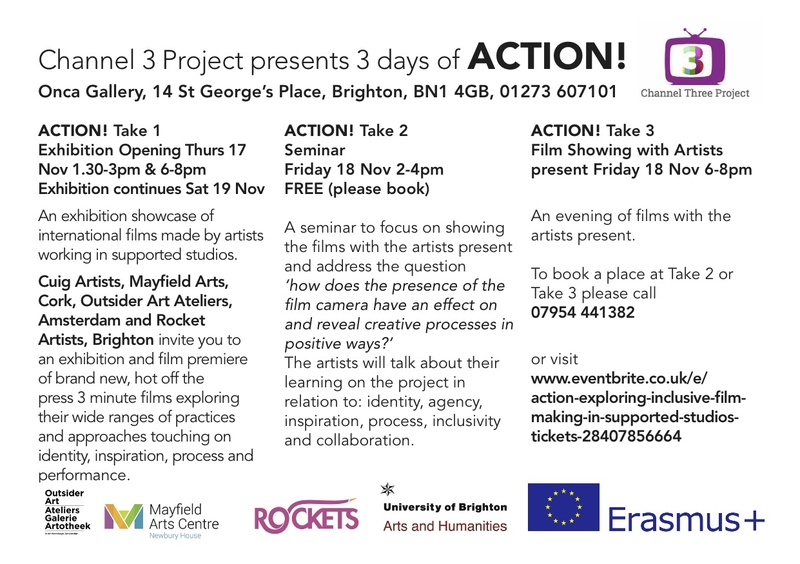 Channel 3 Project presented ‘3 days of Action!’ at Onca Gallery Brighton, as the concluding event of our two year partnership. Rocket Artists hosted a wonderful three day event including an exhibition showcasing the films created by educators and learners which explored their wide range of practices and approaches touching on identity, inspiration, process and performance. Day one at ONCA Gallery began with the visiting partners receiving a gallery tour followed by a creative group activity around planning and preparing for the seminar. After lunch we had a private screening of the films with refreshments. It was fantastic to view the films on the big screen! We had lots of quality time in the afternoon to visit Brighton and socialize with the group. Day 2 we conducted our group evaluation of the partnership. This was really beneficial as we had a good opportunity to discuss what the successes and challenges were over the two year partnership and marked the achievements of leaners and educators. Following a lovely lunch, the seminar event kicked off which was a really exciting event attended by invited guests and members of the public. The question addresses was ‘How does the presence of the film camera have an effect on and reveal creative processes in a positive way?’ The artists spoke about their learning on the project in relation to identity, agency, inspiration, process, inclusivity and collaboration. Our films were screened during the evening with the artists present and received great feedback! Day 3 was exhibition day, ONCA Gallery was open to the public from 11am – 4pm with an exhibition of images and and outcomes from the partnership along with the projected films. The three day event was a fantastic celebration and conclusion to the two year Erasmus+ partnership. Both learners and educators had learned so much and were keen to develop new skills in film making and continue to share with as wide an audience as possible. Three Days of Action at Onca Gallery Brighton! Action! 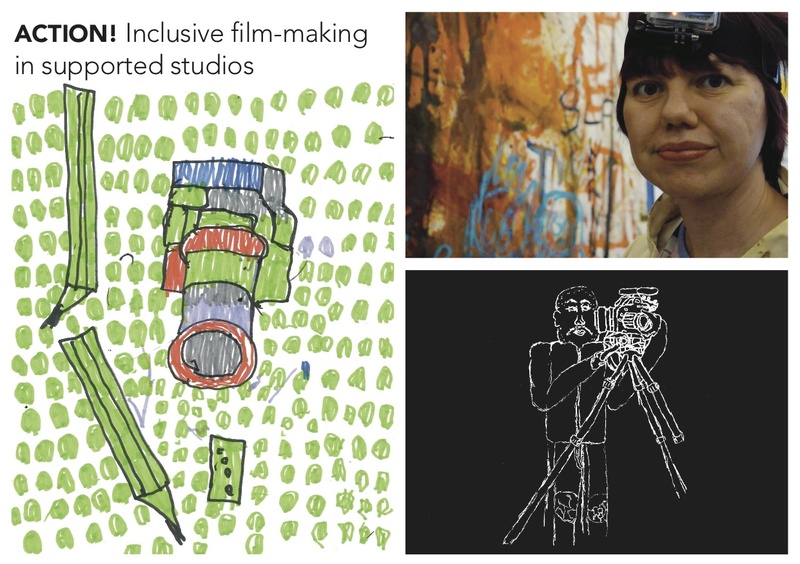 Inclusive film making in supported studios is a three day event at Onca Gallery Brighton, hosted by Rocket Artists Brighton as the final elements of Channel 3 Project. Day one features an exhibition showcasing the work produced by Cúig artists Mayfield Arts Cork, Rocket Artists Brighton and Outsider Art Ateliers Amsterdam over the two year Erasmus+ partnership. The three minute films explore a wide range of practices and approaches touching on identity, inspiration, process and performance. On day two, a seminar focuses on showing the films with the artists present and will explore the question of ‘How does the presence of the film camera have an effect on and reveal creative processes in positive ways?’ The artist will talk about their learning on the project in relation to identity, agency, inspiration, process inclusivity and collaboration. Day 3 will showcase the films with the artists present. More information below! Today we filmed Desmond doing some kickboxing excercises at the Amsterdam kickbox school Saban Gym. The owner, mr Saban him self (right on the photo) taught Desmond some new tricks. Meanwhile camera crew Elise and Sybrand were taking shots. Desmonds’ film will be about kickboxing, a mix of animated and ‘real’ footage! In February 2016, partners Mayfield Arts, Kunstwerkplaats, and Rocket Artists Brighton met for our midway meeting in Amsterdam over three days. It was exciting to meet again to discuss our progress, view movies created to date and get involved in learning new skills in a series of workshops organised by Kunstwerkplaats. We discussed activities during an initial planning meeting, focusing on the progress of our project, any difficulties or obstacles encountered and possible collaborations and IT exchanges. It was great to have a tour of the Cordaan studios again to see some of their amazing and inspiring artwork. Day 2, editor Moniq introduced everyone to stop motion animation. Individual stations were set up with a video camera mounted facing a desk and the artists began to make short animations, working on their stories, designing images and creating backgrounds. Once they were ready, learners were able to view their frames on a laptop screen, with each movement recorded by simply hitting return on their laptop. Each frame was recorded and transferred onto a file on the laptop, once they had finished filming, the whole movie was instantly ready to watch. Ailbhe worked on a piece about a parrot and a girl and lovely bones, Louella worked on documenting her trip by aeroplane, Matthew made a piece on Fairgrounds and rollercoasters. Elisa then showed us how green screen works, she set up a large green screen with a video camera and laptop. There were lots of props and costumes available and Elisa had a selection of movies which could be used in the background. Each artist then decided on a theme or story for their movie and acted out their role in front of the camera. While these activities were happening, we continued our planning meeting to further discuss our partnership’s progress to date, our plans for the seminar and screening in Brighton. Discussions were held with the editor about how to communicate in the future. Once all the movies had been finished, Niall edited them and put together a showreel for screening. We had dinner downstairs in the canteen and we enjoyed a lovely meal with all our partners. Once we were finished eating, we got bowls of popcorn and we watched our movies. Michelle also screened a portion of ‘Beyond, Irish Outside Art’ a recent documentary portraying the Cúig artists and their studio work. Day 3, an early start at Kunstwerkplaats at 9.30. We travelled by tram to Central station and were very excited to get a ferry across to the Eye Museum, a film museum dedicated to cinema. After a quick coffee, we met with Bert from the Outsider Art Gallery and were given a guided tour of the museum. There was an exhibiton of filmwork entitled ‘Close Up’ – Film and Video artists from the Netherlands featuring really interesting work including performance body art pieces, observations of architectural developments and abstract image and lightworks. Following our lunch, we said our goodbyes until our next meeting in Brighton in November, full of inspiration, new ideas and lots of new creative skills! Now that the group have learned how to use the camera, set up shots as well as basic editing skills, its time to put it all into practice. Learners began using the camera at different opportunities during the weeks and months following the video training workshop, working on storyboards and ideas about how potential short films might take shape. Becoming familiar and confident with the camera was one of the most important things for the group. Some learners focused on filming aspects of their own professional practices, focusing on different techniques and creative processes they engage in. Events and exhibitions the adult learners were involved in were also filmed. The next phase of our Erasmus+ partnership is a mid way meeting of the three partners in February 2016 in Amsterdam. This will be an opportunity for the group to share their learning, show the short films they’ve made so far and discuss their experiences and any issues. Niall the editor will also be on hand to give support and expertise.